The technology of the sundreamglass devices needs a minimum requirement of electricity. With this advanced technology, sundreamglass heating panels are very thrifty and remarkably efficient. The immediate transmission of energy allows direct control and adaptation to the changing conditions of the environment. The almost immediate reaction of the sundreamglass devices makes better use of the heat gains dependent on outside temperatures. The infrared heating panels need a minimum requirement of energy. 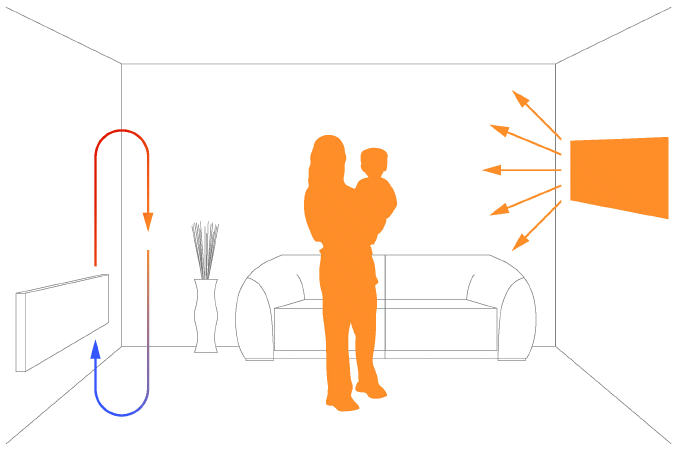 Easy and separated heat adjustment in every room of the house. Environmentally friendly product. Extremely easy installation and activation, fast and easily adaptable to all rooms equipped with electricity. Traditional heating systems move the heated air. High in the room air cools down and falls, then goes up as a result of heating, forming draft and a temperature difference between floor and ceiling. The sundreamglass system, warming the objects in the room, does not generate drafts. The air is evenly tempered creating a pleasant well-being.